Dawn at Frugal for Life highlights some great blogs today. Educating The Wheelers post on baby essentials reminded me that many of the items on my list aren’t necessary. 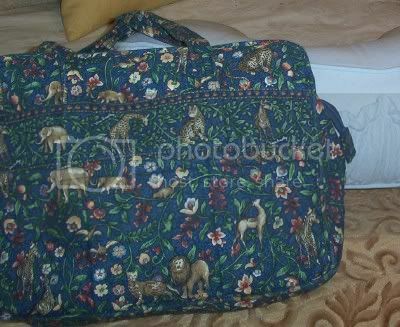 Like the Vera Bradley diaper bag pictured above. Sure, it was half-price at a thrift store ($2.50) which I was browsing while my son attended a (free) preschool enrichment class yesterday. I could use the insurance company tote bag or that plastic Enfamil propaganda pouch the hospital distributes instead. Let’s face it. Sometimes I battle warring powers of bargain hunting and simplicity. In many ways, I do pare down: that diaper bag will carry a blanket, homemade wipes, a fresh sleeper and a couple of diapers—no bottles, pacifiers, assorted brain stimulation toys. I sold the wipe warmer and bottle sterilizer after our firstborn, and this time around, I need far, far less. Still, I find myself sitting in the family room after church and admiring everyone’s cute baby stuff. Then I think to myself, How far have I drifted from Amy Dacyzyn's breadbag diaper experiments? Frugality can be entirely too relative. I’ve bookmarked the Wheelers to keep myself honest. Just don’t make me give up the diaper bag. What baby paraphernalia are you too frugal to buy the second (or fifth) time around? What do you consider your essentials? Honey, make room in your quest of frugality and simplicity for a touch of whimsy, and fun! You like the bag right? According to one of the wisest men I know, if you buy something and you truly love it and plan to use it not just admire it and never glean pleasure from it, you have made a good deal. Enjoy your bag, I can be happy for you that you have it and take pleasure in it! have no children, but I have a new baby niece and it was hard not to buy a lot of those super cute girl outfits at Target! I did restrain myself and got her a lot of perfect and cute outfits at the thrift store (many with tags, even!) but I can see how a new mom could easily buy too many full price or unnecessary clothes! My friend said her baby swing was a waste of money, for what it is worth. I deleated my commnet above so I could edit and say that many mothers have told me that the super expensive baby detergent (Dreft, All Baby, etc) was a waste of money. Use undyed unpurfumed detergent if the baby is allergic to dyes/scents. I thought a baby swing was a frivolous unnecessary item and we received one as a gift. It was a lifesaver! This was one of those things that was worth every penny of the ladies who joined together to give it to us! We, too, have tried to keep the baby stuff purchases to a minimum because we don't need/use all of them and who wants all that clutter in your house!? Another great help to me was a $10 used exersaucer that my daughter used from 5 months until over 12 months - a huge lifesaver! I agree that sometimes a simple little pleasure (like a cute diaper bag) at a good price is a good buy because you will use and enjoy it! The wipe warmers, bottle warmers, fun little gizmos, gyms, bouncy seats, all that stuff was fluff for us. But the SWING, it was a GLORIOUS thing to have. It doubled as a high chair in many of those early feeding attempts. We find the swing useful at times also, but if it's not the first baby then the batteries are unnecessary...lol...everyone wants to push the baby anyways so we just teach the olders how to do it *softly*. And then they get to smile at and talk to him. Baby #3 preferred to just sit in it and watch the room, she was a quiet observer and we called it her "perch". Also a sling, and hip hammock when they can hold their head up, to snuggle baby and carry him with you as life around continues to keep moving. They just love to look at Mommy's face. Rather than a baby tub we use the sink and a folded towel under baby. 3 babies ago I purchased a $300 Medela pump at a garage sale, complete in the box, for $40. It doesn't get much use now as I don't really go anywhere away from baby, but a great find and useful at the time. And lastly (sorry so long) I'd say less clothes...mostly for time saved doing laundry. They grow so quickly. We all need beautiful things in our lives! I think knowing you paid $2.50 makes it even more beautiful! My boppy, I bought from Goodwill for whatever they charge for infant stuff. I used it with the baby and now I sleep with it! It is perfect for reading in bed! and when they are old enough...exersaucer! They can eat in it, play in it, and it can be washed! and Desitin. Nothing works better. That is really all you need. The other stuff is cute and nice sometimes but babies really only care about hunger, messy diapers, sleep and being held. For me a diaper bag is in the unessential category. I sometimes use one for a few months, but I prefer just to carry wipes and a couple of extra diapers in my purse. I hated lugging something that big around, but most people like having one, so I think it is just a matter of preference. My sling was a necessity. A stroller for trips to the library where I needed the basket space to hold our books has been great to have. Good nursing bras also were essential. And for my girls who both have sensitive skin and were much more prone to diaper rash than my son, original formula Desitin (and no other brand stuck to their skin as well, I tried all the generics) after every single diaper change was/is essential. As I sit here nursing my 12th child, I have to chuckle a bit about this topic. I have sure learned a lot and changed a lot of my own thinking over the 20 years since I became a mother about what is needed and what isn't. Swings: used one for all the first 7 children, but when we had twins (# 8 and 9) we hardly used one. The reason I think is that we had enough older children who all wanted to hold a baby, that it just wasn't needed. We also used "bouncy" chairs A LOT with the twins when we might have used the swing with the others. We didn't use a swing with babys 10 and 11. Now, with number 12 we seem to be back to not having enough older children that want to hold a baby ( we have 5 children 5 years and younger, so our crowd is on the young side) and this baby was being a bit on the fussy side at about one month of age. Hubby said let's go look for a swing - no matter what it costs! LOL! We went out looking and found a table top one that we really like. We can put it just about anywhere! Cribs: Always used a crib and when the twins were born we put two babies into one crib for the first 4 months. After that they were in seperate cribs till about age 2. When we were expecting nubmer 10 we had to get creative because we were just out of room in our house! We had 9 children and 2 adults in a 4 bedroom house that had fairly small bedrooms. We had a small walk in closet in our bedroom where we had slept several of the children till they were sleeping through the night, but we now had to think about it actually becoming the "nursery". And, so that there was still a little room for our clothes we decided to use a pack and play for a crib instead of a full size crib. We got one with a bassinet for those newborn days. As it has turned out babys 10 and 11 stayed in the playpen till they went into a "real" bed and baby 12 is happily sleeping in the same playpen even though we do have room for a full size crib in our new house. For one, we don't want to spend the money on a full size crib (gave away the two we had - they were both used when we got them and had gone through a lot with the 9 of ours that used them!). And two, we found that it isn't needed. By the time a baby is growing out of a playpen size crib he/she is ready for a toddler bed or bottom bunk. Nursing pillows: I only bring this up because you mentioned the Boppy. When I nursed the twins I did it with the aid of a special nursing pillow made for nursing twins. Keeps them in the right position for nursing both babies at the same time (mine nursed about a year - though the outgrew the pillow by about 10 months). That pillow was a huge necessity! I had always used bed pillows for nursing singletons before that. After the twins, with baby 10, I thought since the twin nursing pillow was so awesome I would get a boppy for nursing my singleton. I don't know why, but I never found the boppy as comfortable as just a bed pillow. So, it still sits on my shelf! I try it with each new baby, but it just doesn't work for me. Diaper bags: Got to have one and the ones from the hospital are free...just dump all the propaganda into the garbage can! LOL! I am pretty happy with the newest hospital bags being black. Goes with anything! And a Dad can carry one without being too embarrassed! Hated those Peter Rabbit bags from a few years back! Ugh. I must have had 4 of those! I have also found that as baby gets a bit older a small backpack works great! Monitors: Got to have it if you live in a big enough house that you wouldn't hear the baby if he/she cried from his/her room. Never needed one when we lived in an apartment or small house, but you gotta have one for a bigger house and/or a two story. Okay, I could write a small book on this subject, but I'll try to stop here. LOL! Gah! I did not buy an awesome swing for my niece at a yard sale because my friend said that her baby hated it! Now I'm kicking myself! I'm with others here, as well. Don't feel bad about the diaper bag. Part of being frugal is being able to enjoy having something nice now and then, even if it is not a 100% need. Just think, when you're done you can sell it at your next yard sale, and bless another woman with your adorable diaper bag! My friend who has 7 kids only has 1 "necessary" thing. A safe carseat. Everything else her baby needed was provided by someone's arms or pocket or bed. And then, 'way back, a great aunt used to put the newest baby in a drawer (not closed, of course) Not that I'm recommending that!!! When my firstborn came (12 years ago) quilted, sophisticated Black Bags were the newest thing and I remember aching to have one. They were well over $100 then, never got one. So instead of using one of those awful hospital Peter Rabbit/Enfamil bags I just got a big cute tote and put the diaper, bottle, wipes in there with my wallet and keys. I've always traveled kind of light. Another thing remembered from those days 12 years ago...what did you wrap the used diaper in to toss in the trash? A plastic grocery bag? A paid-too-much-for scented diaper tossing baggie? OR...and this was the winning pick: the re-purposed Blue Plastic Sleeve in which the New York Times was delivered when it rained? Obviously, the last one advertised to all that: you were not only an INTELLECTUAL, but could also afford A HOUSE WITH A YARD (where a paper could GET wet in the rain). Don't feel guilty about a 2.50 Vera Bradley diaper bag! Use it, then sell it on eBay for a profit. Even frugal people don't have to deny themselves every thing! We might not buy every bargain we find, but one doesn't have to live a ife of aceticism, either. --Carseat--very necessary--we got a convertible model at Walmart, and added an insert from a thrift store when he was little. --Place for the baby to sleep.We got a crib from a friend for $50 and it can be a toddler bed or a double bed. --Footed sleepers and a few onesies if its summertime--I'd say 6 each--they ran me about a quarter apiece at yard sales. Most of his clothes are from yard sales, except for a few outfits given to us from friends. I found yard sales to be cheaper and sometimes had better stuff--I got mainly Carter's, Baby Gap, etc. I like the black hospital diaper bags, I keep one in the car with a change of clothes, blanket, etc. I have a little clear case that I got somewhere free and the diapers, ziploc bag of wipes, extra bib fit in nicely. I just throw it in the diaper bag or my purse. Also our family already used All Free and Clear detergent becaue I have sensitive skin...We are able to throw the baby clothes in with ours. I hope to give away or loan our stuff when we don't need it anymore...people have been so gracious to us. I'm laughing at all the wipes as necessity. I do use some store bought wipes but the vast majority of the time my son's bottom is cleaned with a wet washcloth (I bought a huge batch just for this purpose. I also cloth diapered him from the get go. I use disposable for travel and his Parents Day out but that's it. I didn't realize until today that I could leave comments without having a blog. I've been loving reading yours. I did want to comment on the buying a new house/DH finishing dissertation/having baby thing that it may depend in part on his committee. My DH finished up last year before Christmas and I'm in the final stages now. In each case, it's been very much a drop everything to do revisions/answer questions/schedule things process. I think it would have been difficult to have moving/working on a house at the same time. But, I know every committee and every discipline is different. We used a pack of washcloths and water for wipes, too...just put a few damp ones in a Ziploc for the car. Thanks for the outpouring of advice, everyone! I just feel this terrible tug of wanting "worldly things" and wanting to be as frugal as can be--sometimes I think too hard and lose perspective! Also, I'm glad to know the hospital diaper bags are finally black and basic...it's been four years since I had my first. I think then I had the black nylon Nicole Miller bag from a thrift store, Debbie! Jordana, I'm a stuff-the-diaper-in-the-purse girl, too, but I like to have a dedicated bag to keep in the car and carry for daytrips, overnights, etc. I think you *should* write a small book on the subject. As a mom of 12, you're certainly an expert on all things baby! LOL! Maybe I should start a second blog where ladies can just ask questions about pregnancy, childrearing, teenagers, all three at the same time, etc.! Just this last Monday I finally got in to see my chiropractor for the first time in a month AND left all the children at home with daddy so I oould really relax during treatment. My chiro. intoduces me to a new therapy staff member and somehow we get on the subject that my 3 month old sleeps through the night. New gal groans. Her 5 month old wakes 3 times a night! My chiro says "while you are massaging her you better ask what her secret is! Jerri is a wealth of baby and childrearing information!" So much for my relaxing massage! Just enough time to give my "Getting Babies To Sleep Through The Night" speech! LOL! Ok, I am way in the minority here, but I love my wipe warmer. My twins were born in late winter in the midwest, and their changing area is on an outside wall, so those wipes got pretty cold otherwise. I did just buy a pad for their dresser top to change them on rather than a separate changing table. As for swings, my son loved his, and my daughter just liked hers ok. It is best to just pick one up secondhand just in case, since you won't know if you have a swing lover or not until the baby arrives. Oh Meredith, enjoy your Vera Bradley bag! I don't even NEED one right now, but would have bought one if I found it for $2.50! LOL And yes, that could be considered frugal if I could re-sale it or give it away to someone that needs one and would love a name brand. I never got a hospital peter rabbit plastic bag....had both of mine at home. I had just a nice little one that was a gift with my first born. I didn't carry alot with me, but it was nice to have in the car. We never used a swing. We got rid of the high chair and plan to use a booster seat with a tray when he's ready for solid food--takes up less space. With my older one not yet pottytrained, I *need* a diaper bag. But I use an old backpack of my husband's. That way, the backpack goes on my back, I hold the carseat with one hand, and lead the toddler by the hand. I'm so out of it, I only stumbled across this post of yours today! I've had lots of interesting feedback on my post and I want to make sure to say that I'm not trying to make anyone feel bad about anything they've purchased! We have lots of things that don't make my list of "essentials" and happily used them to make our lives easier ... I was just trying to sort out, when it came right down to it, what you really needed. Especially if money was really, really tight. Thanks for the link and the post!